1305501187 -The global business environment is rapidly changing due to shifts in geopolitical alliances, active support of international institutions in promoting market-oriented economic reforms, and advances in the development and use of information technology. 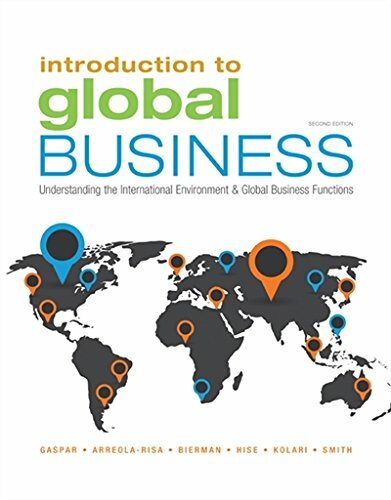 INTRODUCTION TO GLOBAL BUSINESS, 2e addresses these challenges by providing a comprehensive analysis of the global business environment and lays the foundation for the functional tools used to better prepare students for a global business landscape. The text flows smoothly and clearly from concept to application, asking your students to apply their learning to real-world personal and professional applications. The specialized author team introduces globalization through unparalleled scholarship and a world-view presentation of the fundamental pillars of the global business environment — culture, ethics, economics, and information technology. Ensure that your students understand the procedures and concepts they need to know with MindTap for INTRODUCTION TO GLOBAL BUSINESS. MindTapTM, an online course management and learning system, combines the best of current technology to save time in planning and managing your course and assignments.